Now, if you are TRULY a beginner, you won't be asked to teach voice lessons. You are either a solo singer already, or you have some experience singing in choirs. Hopefully, you also have some skill at the piano as well, because without that skill you will be handicapped. You may think that this sheet is very ambitious for a first lesson. Actually, we may not get to the third song, or the round "Heigh Ho" this week. But I want to be sure there is enough variety in the lesson for a young child. The warm-ups, breathing exercises, and posture discussion and work is necessary, but they will only be KIND OF FUN, compared to the excitement of starting new songs. We aren't talking about college-level singers transferring to your studio after some years of lessons and being willing to focus on just one song for a bit; we're talking about new singers. I like to expose these young children to at least one new song every week for a few weeks, and then we will settle down and focus on just one or two a lesson, once they have identified a couple of songs they like. Nothing is instant. With young children, I acquaint them gradually with the foundation techniques of ultimate importance, posture and breathing. Every week for a very long time, I demonstrate "the marionette string which comes off the BACK of the head, pulling the spine up, and the other string which hooks under the sternum (right under the ribs) and pulls out and up at a 45 degree angle," and watch them do it too. We walk to the door and flatten our backs and heads against it... kids are always surprised to realize they are not standing tall like their favorite Hollywood actors! There is much discussion of slumping over cell-phones and computers. We sit at the piano bench like cowboys, backs slightly arched and knees a bit apart, still with the imaginary strings pulling head and chest. Breathing comes next. There is so much to say about correct breathing for singing... which is really correct breathing for life. Down into the diaphragm. Looking in the mirror and inhaling without a lift of the shoulders. WATCH OUT for those shoulders! A good technique for the first or second lesson (depending on their age, and waiting until they feel comfortable with you) is to plop down on the floor on your back with a heavy-ish book on your tummy: breathing correctly, your inhalation will lift the book, of course. Let them do it also. The candle exercise is a great favorite of mine. Hold up one finger, pretending it is a candle with a flame that you want to blow carefully enough to make it waver, but not go out. That helps ensure a controlled diaphragm where the air is slowly released, not suddenly in a rush. Watch the second hand on the studio clock... start together, and tell them to drop the "candle" when they run out of air. How many seconds? Write it down on the empty line. Next week, compare. The "candle" exercise is done 3 times: first, with silent blowing. Second, with an "oooo" all on one tone, in an easy part of the voice. Lastly, pick a song that the child knows - perhaps "Happy Birthday", and begin singing it all on one breath with no new breaths or breaks (harder than it sounds - I do a bit of a drawing-out gesture with my free hand to encourage the voice to continue through the pauses in the song). All this time, I am blowing, "ooo-ing", and singing along with them. It is a bit of a competition, as well as modeling. Their posture needs to stay upright and beautiful all along. Oh yes, pitch matching. I have only ever had 4 voice students who needed to do this, so in actuality, this exercise would not show up on the lesson sheet until after I had listened to them sing their first lesson, and determined that this was necessary. But I have 2 students right now who need to work on "hearing" the piano key tones and hearing their own voice. You may think a student with this lack of tone perception can't improve, but actually, I have seen GREAT IMPROVEMENT happen, especially when this exercise is employed faithfully together with a chosen repertoire piece being memorized and a recording listened to over and over again. Is this a cure for tone deafness? I don't know, but I have seen amazing strides made, though not quickly. To do this tone-matching exercise at home, they must have a piano or a keyboard, of course. We do it together at my studio every week until I can see that they won't skip any of the black keys on their way from Middle C to higher C.
Oh, did I forget to mention that they will need to learn the names of piano keys? If they don't know the piano already, then print a paper keyboard for them, and start quizzing them on the sheet each week. Don't fret; they will think it's cool to know the names of the keys on the piano, if they don't know them already. The Animal Sounds page will give YOU a great opportunity to look and sound very silly... just the kind of encouragement they need to loosen up over the next few weeks and do the same. I find that page of warm-ups very useful because the puppy-dog pants encourage diaphragmatic breathing, the whimpering puppy, meowing cat, and mosquito sounds encourage RESONANCE and therefore effortless VOLUME, and the gorilla hoots encourage an open throat. What about Lavender's Blue? Sing a verse or two, then start over and invite them to sing along with you. Their voice will probably be very soft. This is only temporary, so don't worry. And don't make them worry about singing softly. They'll get louder by and by. What about When Love is Kind, and White, Orange, and Green? These are all good beginner songs, though I have never given Lavender's Blue to a boy. For a boy, consider The Cat Came Back instead. And sing along, for now. It is much less intimidating for young kids to join in with you than to have to go solo! And the round Heigh Ho? For a first-lesson student??? Yes. It will be a long time before they are able to hold their part while I sing the other, but every week we will try it, and they will gradually improve. There is a lot to be learned from this "simple" song! Just play it through a couple times and direct them to a YouTube video, if their parents allow. I have recently been asked to teach vocal lessons for a six year old girl who has been taking vocal lessons for a while, but I haven’t had any formal training for this. I have been taking choir for a number or years but I don’t know exactly how to teach music lessons, so I was wondering if you had any advice or pieces of music or books or something that I could use in my lesson that would teach her but still be fun. 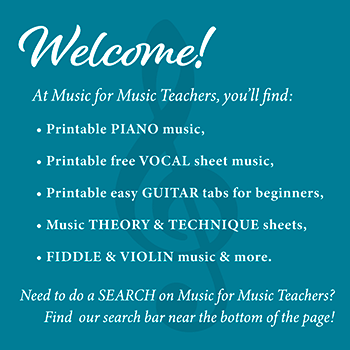 If you do a web search for "how to teach voice lessons" you will come up with many excellent suggestions. You need to focus on POSTURE and BREATHING. I do have quite a few ideas for teaching voice students, but you will have to read all through my site to garner these ideas! I suggest starting at the main vocal page, Free Vocal Sheet Music, which links to all the vocal music offered on my site. Then look at the Broadway Musicals List page, which discusses my idea of suitable songs from musicals. Then look at all the Singing warmups pages for more details about vocal production. Then, study all the folk songs pages on the site, because these are the most appropriate for a six year old. At the bottom of the Broadway Musicals List page are some book suggestions for kids. Take a look at the Lavender's Blue page - print it out for her, and show her the videos on that page. Hearing her sing that song will give you a good idea of what she is capable of. Six years old is VERY YOUNG. I'm surprised she has already been taking lessons! In addition to Singing Warmups & Exercises, I like to cover about 3 songs per lesson, asking kids to memorize the lyrics of at least one verse every week. Then, I usually have a ROUND that we work on together. "Heigh Ho, Nobody Home," "Have You Seen the Ghost of John," & "Ah, Poor Bird" are the easiest ones for beginners, and they can teach a great deal about breathing. HOLDING THE PART may not come for a long time, but I just keep trying it again every week, because gradually they will get better. My approach there is to sing it through together, then have them start over (while I play their part on the piano), then when they get to part 2, I start singing part 1, while continuing to play their part. Sometimes I am not so successful! Now I'm making the assumption that you also play piano. If this is not the case, then teaching voice will be harder for you. I have to admit I RARELY take students that young, especially voice students, because they can't read music. Everything must be recorded for them. Ask her parents to send her with an iPhone or iPad or some other means of recording what you do - and have a lesson sheet made out that has dots or places to check off to show that she actually practices each day! These are my suggestions. Your choir background will stand you in good stead as you establish a routine for her lessons. I do spend time initially doing "sirens" & puppy dog whimpers (see the Animal Sounds Vocal Warm-Ups page) and other exercises that seem to make sense for the student's voice. You may find you really enjoy singing with your own students - good luck! Spend time looking at other sites about teaching. You will find your way.